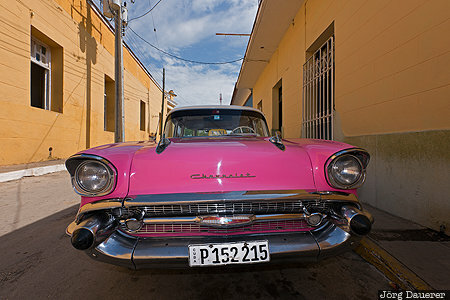 A pink Chevrolet Bel Air in a small alley in Trinidad. The classic car is illuminated by a flash gun ("fill flash"). Trinidad is in the province Sancti Spíritus in the south of the Caribbean island of Cuba. This photo was taken in the afternoon of a sunny day in March of 2016. This photo was taken with a digital camera.